Lately I’ve been very interested in picking up a Korg RK-100s keytar in red just like in the video above. I currently have the original Korg RK100 in red and it’s probably the best keytar I’ve ever played. It truly feels like a guitar to me which is an instrument I originally played on as a kid. Although I don’t have the Korg RK-100s just yet, I thought I would write a few impressions about it as I do my research. First, the RK-100s has been out in Japan for about two weeks, perhaps longer. Usually the major music stores near me always get in a floor model of the latest Roland, Korg, and Yamaha gear. However, the Korg RK-100s has been nowhere to be seen other than a flood of them on Amazon Japan. I asked the manager at Shimamura which is a pretty big store here and they were not interested in the product. In fact, he said they likely would not get a floor model which I found odd. After all they did get a Roland Lucina and AX-Synth which were both prominently displayed on release day. So why not the Korg RK-100s? The manager just seemed to laugh and then I realized. Oh yeah, Roland is generally more popular than Korg from what I’ve seen. Yamaha has no keytar in the mix so they are happily standing on the sidelines watching to see how the Korg RK-100s flies against the Roland. In fact, maybe Yamaha is sitting there going “Keytars, yeah right, been there done that…laugh”. Another interesting thing about the Korg RK-100s is how it’s being demo’d on Youtube or lack thereof. There are just two videos at the moment from Japan even though it’s been out for two plus weeks. One is performed by a clown looking guy named H ZETT M and another ( shown above ) by an unknown artist AYANO (Cyntia) of what band I don’t know. ( Yes, I do follow the Japanese music scene very much here in Japan ). Both videos don’t really show anything outstanding about the product or what it’s all about in detail. Instead there is a lot of playing around with the touch strip along the bottom of the keys. It reminds me of when the Whammy Bar first came out on guitars. Everyone under the sun was grabbing that Whammy Bar and going nuts. All of that is fine but I’d like to see and here more details about the product. I also think the Korg RK-100s looks rather small. I was hoping to see this in a store to actually get a feel for the size. The original is just perfect!! Some people call it big, but not really. I think they are likely coming from the small Yamaha SHS-10 or KX-5 model for example which are significantly smaller. ( The KX-5 is heavier even! ) The keys on the original are the large size while on the newer RK-100s they are the smaller mini keys. They don’t look that bad, but again there is not much info about that available just yet. One big issue that many might have is how expensive the Korg RK-100s is. In Japan it’s selling for about $600 which is a bit expensive. The Roland AX-Synth sells for around $1300 on Amazon Japan which is brutally expensive. I’m sorry, but that is WAY too much for a keytar and I’ll never pay that much for one. I might as well spring for the MOOG Liberation if I’m going to pay a ton of money for a keytar. The Alesis Vortex sells for about $200 in Japan which is a great price. So the Korg RK-100s sits in the middle with regards to price. Looking at things in that perspective, it seems the Korg RK-100s might not be that expensive, but when you compare it to other non keytar synths, I think it’s price point is debatable. NO MANUAL! Yep, Korg has yet to release a manual in either English or Japanese. Sure it’s early in the release, but usually the manual is available at least during the release time. The editor is available and after testing to see how it looks, I think it’s pretty nice. I actually installed it to get a better idea of the RK-100s because I couldn’t find a PDF manual anywhere. Finally, it seems Korg is bent on treating the Korg RK-100s as a gimmick given they seem to use some pretty interesting people to showcase it. Indeed the keytar concept is seen as kind of a gimmick by a lot synth enthusiasts, or it’s viewed as something stuck in the 80’s. That’s all understandable I suppose given the fact that there have been very few big name artists strutting around with one on stage. It’s great that Korg along with Roland are trying to keep the keytar alive. I for one really enjoy playing them and do believe that one day, someone is going to come along and just blow everyone away with one. Then we’ll likely see a rush by many to get one. Keytars are cool. We just need to see more cool people playing some cool songs on them. For now I’ll stick with the original vintage Korg RK-100. Just in time for the annual Japan summer circus. I was repairing a copper trace that went flaky on my Korg Polysix this morning. I managed to get it working again and while warming up the Polysix, I recorded this jam using a custom “Distorted Sync” patch for the Yamaha V50. 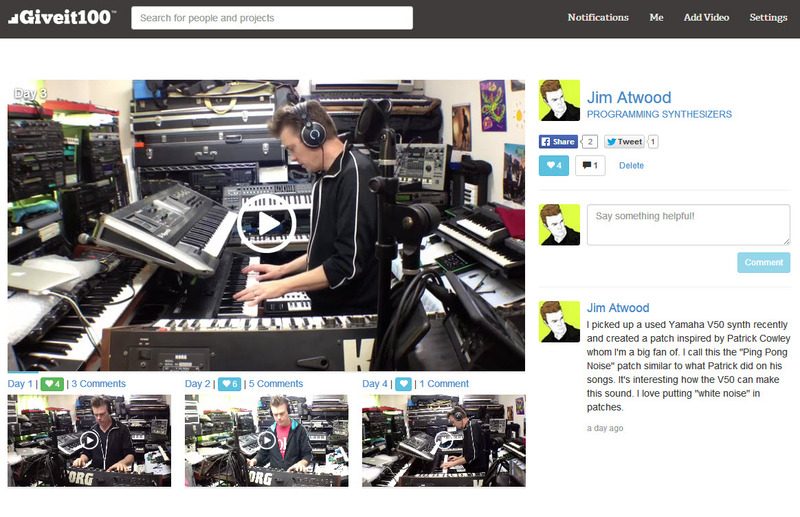 The arp in the back ground is from the Korg Polysix. I have the arp set to octave chord memory with a touch of VCA modulation. Video was recorded live. I just jumped in and started playing off the top of my head. Someone asked me about effects recently. I usually use a Boss DM-2 Analog Delay on most everything when I do quick videos. I also currently have a Sony DPS-V55 Mult-effects processor adding for reverb or slight modulation. I try to run dry as much as possible though because on stage, too much effect processing really doesn’t sound great at the places I play. I only add when needed you might say. I love the Boss DM-2 though. I also tend to shift effects around quite a bit simply because I have too many and am trying to properly check each one out. I recently picked up an old Boss GT-5 which has analog distortion in it which I really like. I can’t stand the digital distortion “Fizz” in the newer GT units such as the GT-10. I don’t know how people cope with that annoying “Fizz”. Presto! It’s gone on the GT-5! Enjoy the video and a glimpse into my music room…laugh! Yes, I do have all the gear I say I do on my blog. The Yamaha TG500 I recently picked up is turning out to be one great little sound module. If correct it was originally released in 1992 and was used on quite a bit of records during the 90’s. In particular I am very fond of the drum kits so far. They are really punchy and loud. I also like the fact that they are not setup in GM fashion. What I mean is the sounds are spread across the keys in a way that it’s much easier to play drums with. I also found that many of the keys had similar adjacent sounds which helped to vary the feel when tapping with your fingers. It just seems that whenever I “feel like” hitting a certain key, a relevant drum sound is attached to it. I guess what I’m trying to say is that it seems the drum kits were very carefully laid out across the keys to enhance finger jamming. Much is the same with the Yamaha RM-50 drum module from the same time period. The synth sounds overall are very good. The pads in particular are fantastic. Lately I’ve been using the TG500 in multi-mode with the Roland Fantom X6 and find the editing is pretty easy. In fact you just press edit and you can scroll to the left or right to find the parameter you need to edit very easily. I can also edit the parameters in more detail using a program like MidiQuest which works perfectly. Both Performance and Voice modes offer a healthy selection of both musical and useful patches. Overall I’m pretty pleased with the module and I highly recommend it if you are looking for some classic yet still useful sounds. The Drum beat was recording live using the Roland Fantom X6 as a sequencer and a Yamaha TG500 Multi-Patch for the drum sounds. The Fantom X6 is the midi clock master and sends a signal to a Boss RC-505 Loopstation on the lower left. The Korg Polysix is then recorded using the RC-505. Several times during the video, loops are erased and recorded again. Korg Polysix sounds were selected at random and the entire track was put together on the fly. There was nothing done in advance here and the purpose of this video was to just show how I work through a track with errors and all. I use the Roland Fantom X6 to record midi using external synths. Sometimes I use the internal sounds, but most often use other gear instead. In the case of the Korg Polysix, I don’t have midi for it. The midi kits usually cost way more than the Korg Polysix so I tend to loop instead or just record audio tracks. People always email and tell me to get the midi kits, but they are just too expensive for me although I know they are perhaps worth it. It’s funny, I actually almost bought the KiwiSix upgrade, but instead ended up buying a second Korg Polysix for less. No regrets. In any event, the Korg Polysix is a great analog synth and I really enjoy playing it.